I am the author of "The Royal School of Needlework - Essential Stitch Guide to Silk Shading' (it does what it says on the cover!) and contibuting author of 'Embroidery: A Maker's Guide' from the V&A (released 5th October 2017). I was also lucky enough to be part of the team of embroiderers who worked the embroidery on the wedding dress of The Duchess of Cambridge in 2011 and more recently I made the replica 105th Napoleonic standard for the Waterloo 200 commemorations, 2015 (read more about this in my blog!). Sarah is thrilled to have contributed to the new book from the V&A, released 5th October 2017! Embroidery: A Maker’s Guide contains 15 beautiful step-by-step projects for crafters at all levels. Each one takes its cue from a different historical tradition – from English goldwork to Indian beetle-wing embellishment, from Japanese kogin to Irish whitework. Projects include a bargello purse; blackwork moth and dragonfly motifs on napkins; a William Morris artichoke motif on a small cushion; Chinese-inspired motifs for adorning a denim jacket; Mountmellick whitework on a decorative necklace-collar; Indian shisha mirrorwork on a clutch bag; and machine-embroidered lilies on lingerie. Designed by teachers and practitioners at the leading edge of today’s craft revival, the projects are both functional and fashionable, and include tips on how to take next steps towards developing your own designs. This modern maker’s guide will inspire all readers with the confidence to express their creativity through the age-old craft of decorative stitching. "RSN Essential Stitch Guide to Silk Shading"
Now available in English, Russian and French! Learn the beautiful art of silk shading with Sarah's book! What's it about? 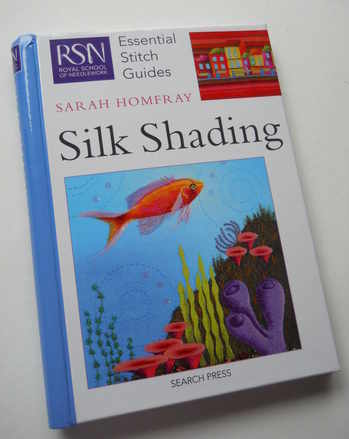 This book takes you through the whole technique of silk shading as it is taught by the Royal School of Needlework, and is a great accompaniment to the Certificate and Diploma course. What's inside? An introduction and history to the technique; materials and equipment; a section about design and colour; inspiration; composition; transferring the design; frames; stitches to enhance your silk shading; getting started (learn the technique with a simple silk shading exercise); more complex shapes; how to tackle curves; how to create different textures; taking your silk shading further (design, threads, fabrics, backgrounds); how to finish your silk shading and a troubleshooting section.